So I’ve just completed grading 55 papers on Citizens United v FEC, and though I’d kind of like to reflect on it a bit, I’m also finding that grading has totally exhausted my interest in the legal questions. (But seriously: the personhood question is a red herring!) Maybe later this week I’ll post the best arguments I culled from the lot. 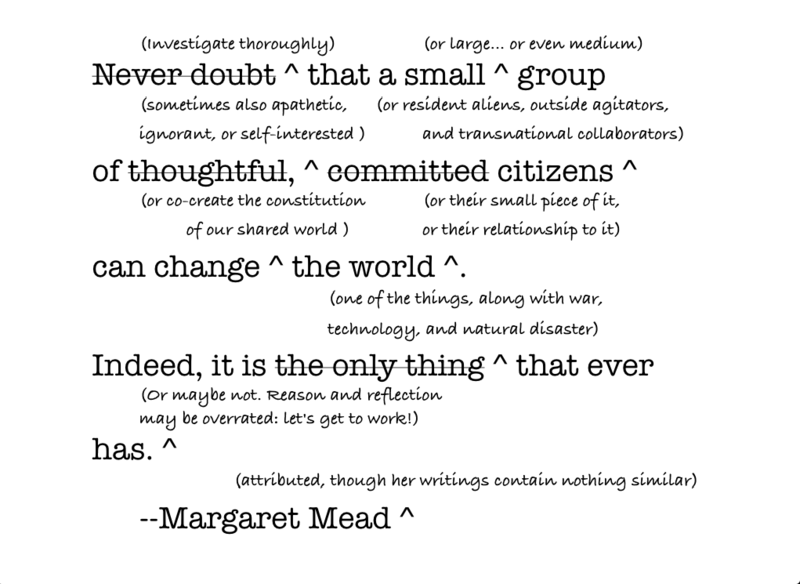 Instead, I’ve been thinking about some of the contested facts that ground our judgments about Citizens United. After reading so much about it, it’s become clear that there are frequently empirically-testable claims underwriting judgments about that case, and that these claims can be converted into predictions that are going to be verified or falsified over the next few years. These aren’t values questions, themselves, but frequently I’ve found that my judgments on the legal questions are in part generated by my differing beliefs about the particular likelihoods behind these predictions. Consider the following hypotheses as predictions that can be tested. The law overturned by Citizens United, the Bipartisan Campaign Reform Act, was passed in 2002 but the limits didn’t effect the 2002 elections. A small piece of it was overturned in 2003 in Wisconsin Right to Life v. the FEC. Citizens United was decided by in January 2010, in time to effect the midterms. Here’s the data… 1998: $1.61 billion, 2000: $3.1 billion, 2002: At least $2.376 billion (source), 2004: $4.14 billion, 2006: $2.85 billion, 2008: $5.3 billion , 2010: $3.7 billion (source), 2012 prediction: $7 billion (source) These numbers are not inflation-adjusted. Back in 1973, Gordon Tullock argued that the value of campaign contributions did not reflect the potential benefits of regulatory capture. In a recent paper, “Why is there so little money in US politics?” Ansolabehere, Figueiredo, and Snyder argue that campaign spending has tracked GDP for more than a century. So increases in campaign spending over the last decade, both before and after Citizens United, may simply track the economy as a whole. Even worse, money spent on elections has been shown to be tremendously inefficient: several different analyses of House races have shown that there is less than 1% effect on the vote per $100,000 spent. (Here’s one from Stephen Levitt, which also argues against public financing.) These findings are consistent with normative judgments like the concern that “money buys access” or that these trends undermine “democratic integrity” by their sheer size. …reduce the transparency of campaign spending. …have no effect on the transparency of campaign spending. …increase the transparency of campaign spending. While it seems tremendously unlikely that anything that the Supreme Court has done will lead to a decrease in domestic investment, legalizing political spending seems like it might make spending more transparent if a lot of previous spending was illegal and thus secretive. The new information on Super PACs is going to be an interesting test of this question. …shift campaign spending from direct candidate donations to indirect issue and advocacy advertisements. Whether or not campaign contributions continue to hug the ratio-to-GDP trend-line, the most likely effect of Citizens United will be to shift funding away from the direct control of candidates advocating for themselves. I think we already saw this in 2010, and the alternative seems less likely. 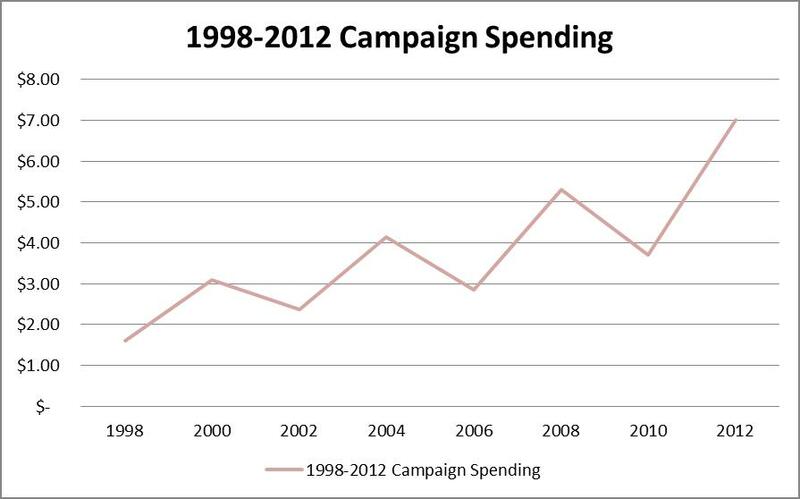 Does increased campaign spending increase interest in political campaigns? Does increased campaign spending overemphasize a citizens’ role as voter, and in so doing crowd out other kinds of citizenship? Does increased campaign spending exacerbate partisanship or increase negative advertising? I think these are all the right questions and I don't have answers. But I've been frustrated by the literature about the effects of money on congressional votes, because I think the impact is on legislative agendas, not on votes. A tiny proportion of introduced bills make it to floor votes, and even the introduced bills do not address many of the important issues. If money affects policy, it is by affecting what gets on the agenda. I've seen that claim as well, and it certainly makes sense. But there are other ways in which politicians are captured by business interests that don't seem to depend on direct contributions, and I'm not sure if the agenda-setting model explains the relative size of spending to the value of the policies on offer. Agenda-setting decisions seem like they could be well modeled through a contract curve analysis of donors, party-loyalists, and voters where the donors are the *weakest* leg. Next Next post: Did the Bipartisan Campaign Reform Act “Bend the Cost Curve” on Campaign Spending?